56006 was built at the Craiova works of Electroputere S.A in Romania. Brush Traction of Loughborough designed the locomotives but didn’t have sufficient workshop capacity to actually build the locomotives. Similar situations with BREL workshops saw the first batch of 30 locomotives build abroad with major components such as power units, traction motors and complete electrical cubicles shipped out from the UK. Although 56006 was offloaded at Harwich on 8th September 1976 such were the remedial works required it didn’t actually enter traffic until the 25th February 1977. 56006 was the first loco to enter traffic although 56001 to 56004 were accepted into traffic only 3 days later. 56006 was allocated to Tinsley for many years along with most of the Romanian batch and could usually be found working from Knottingley, Healley Mills or Shirebrook which were all within easy reach of Tinsley or Doncaster. The early problems with this batch were never really forgotten and as a result the locos never strayed far form one depot .56001 was the exception and this loco was allocated to the Western Region in Early 1985 , just before the rest of the class were reallocated en masse to Toton where they were utilised on Nottinhamshire coal traffic which usually kept them conveniently close to home base at Toton. As a result of her popularity at this event, 56006 joined several of the other heritage locomotives that starred at that event, to form the EWS Heritage Locomotive Pool. 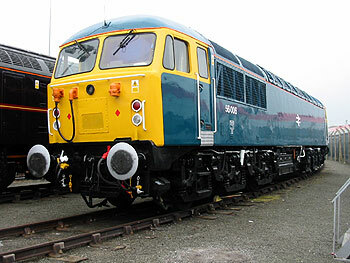 This high profile role meant that 56006 became the unofficial ambassador for Class 56, attending numerous other events. When 56006 was eventually withdrawn from service on 1st December 2003, EWS offered the loco to the National Railway Museum at York, who fortunately for the C56G turned down the chance to take 56006 into the national collection . Their loss became our gain as unlike many of the class withdrawn around that time 56006 led a bit of a charmed life as after attending an event at Barrow Hill Roundhouse Railway Centre, 56006 stayed on for a visit that would eventually stretch on for nearly eight years, instead of making a one way journey to the scrapyard. Then in November 2012, 56006 could at last make Barrow Hill her official home, after she was preserved by the Class 56 Group. 56006 was finally a preserved locomotive, with a secure future. More recently, 56006 has moved to UKRL’s Leicester Depot, where attention to many years of neglect could be addressed and some serious bodywork repairs undertaken. New cab floors, several new sections of bodyside plate and virtually all of the roof is now new metal. After several years of trying 56006 finally made it a Swanage Gala in 2015 and visits to Didcot, Weat Somerset Railway, Nene Valley , East Lancs and Wwensleydale Railway have all taken place and allowed group members and the general public to see the locomotive .